St. Petersburg, December 4, Interfax – Vitaly Milonov, the chairman of the St. Petersburg parliament’s legislation committee, has sent an appeal to the Russian Foreign Ministry and Federal Migration Service proposing a simplification of the procedure of obtaining Russian citizenship for Europeans, who have been insulted spiritually and culturally in their countries. 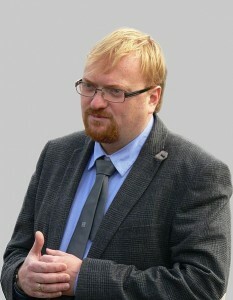 A simplification of the procedure of granting a living permit and Russian citizenship to foreign citizens, whose right to live according to traditional cultural and spiritual values are being infringed upon by the authorities of the country they reside in, has been proposed, Milonov told Interfax on Wednesday. The right of families to live and bring up children in accordance with their traditional belief system and in the spirit of traditional family values is intentionally violated by many Western countries, Milonov said.